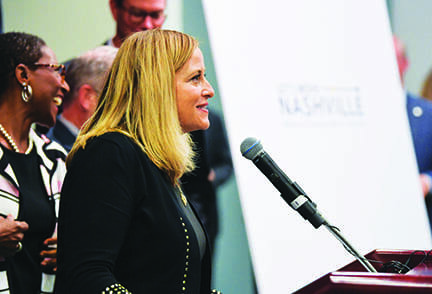 NASHVILLE, TN — Community leaders are responding to Mayor Megan Barry’s ambitious mass transit plan, Let’s Move Nashville, calling for transit justice and intentionality to be at the forefront. The $5.2 billion plan includes a 26-mile light rail and improvements to the bus system with the addition of electric buses, more routes, 15-minute peak service and buses running 20 hours each day. There will also be a rapid bus route along Dickerson Road, Hillsboro Road, West End Avenue and the Bordeaux area. “It is something clearly that the mayor recognizes is vitally essential not just for the growth of the city, but just to maintain a certain quality of life for Nashville residents,” State Rep. Harold Love said of the plan, calling it a “good start” to fixing the city’s traffic problem. He believes the objective initiating free and reduced rates for those experiencing poverty as one of the plan’s most effective points, but does see potential issues with the proposed one-half percent sales tax surcharge, that will increase to one percent in 2023. It is one of four methods proposed to fund the system, in addition to a one-quarter percent surcharge on the hotel and motel tax, 20 percent surcharge on rental cars tax and a 20 percent surcharge on the business and excise tax. “Even some of the critics of the transit system, they want mass transit, but they want it done in equitable fashion and what needs to be much more clearly articulated is the sales tax, which is going to be regressive tax on the poor,” said Sekou Franklin of Democracy Nashville, calling into question how long the sales tax will be in place and its long-term effect on low-income residents. Like Love, Metro Transit Authority board member and Transit for Nashville spokesperson Walter Searcy sees the free and reduced ride option as a positive point in the plan, saying it “will help take some of the bite out of the sales tax proposition.” He also says there needs to be expansion of accessibility for those with disabilities to be able to safely use mass transit and believes the plan will have a positive impact on affordable housing. “Progressive transit policy, in fact, will yield the kind of affordable housing that we all hope that we can advance. If we don’t have a transit plan in Nashville, affordable housing is really a very remote possibility,” Searcy said. While Love stresses that he doesn’t want businesses to carry the financial burden of the transit plan, he does think there’s an opportunity for them to share a portion of the tax. “Everybody’s not benefiting from the growth of Nashville and so when we have businesses that are growing and developing and moving here, there needs to be conversation about what they can do to add to the bottom line of funding this,” he said. Love believes the improved bus system will be essential to those working overnight shifts, saying it will bridge the gap for residents in affordable housing units who work downtown. “We must be very intentional to put in place good housing at an affordable rate,” Love said. Franklin agrees, saying that if a mass transit plan isn’t properly implemented with an equity or affordable housing program on the front end, then displacement and gentrification will accelerate. “You need some type of intentionality behind equitable development, you need some intentionality behind affordable housing that relates specifically to transit oriented development,” he said. Love also said there needs to be conversations about infrastructure and improving roads to make the plan most effective. “It does no good to put in light rail and to increase bus routes and the frequency and reduce the cost if we still have roads that are in disrepair, if we still have some inconsistency in certain parts of town where the streets are still torn up,” he said.